This is Dave Pelzer's long-awaited sequel to A Child Called "It." 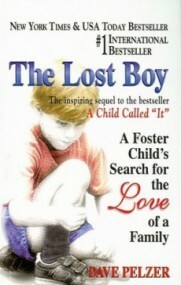 In The Lost Boy, he answers questions and reveals new adventures through the compelling story of his life as an adolescent. Now considered an F-Child (Foster Child), Dave is moved in and out of five different homes. He suffers shame and experiences resentment from those who feel that all foster kids are trouble and unworthy of being loved just because they are not part of a "real" family. This was David Pelzer's 2nd book. This is the sequal to A child called it. This book is about this years 12-18, i think. It is when he finally gets into foster care. He gets into some trouble, but eventually finds the right path. This is an excellent book. Id recomment anything written by David Pelzer. I own all 4 books! The book i read was about a man names David Pelzer, he always used to get abused my his mom becuase she would always be drunk. In this book David ran away lots of times but always got cought and had to go home. His father would usually come to the sation and pick him up. His father does everything for his wife so she doesnt yell at him, The excuses they use are usually dumb like he couldnt go out to ride his bike. When he doesn't even have a bike and never can even go out side. But the police believe there parents. David went to 4 foster parents he lived with all four of them from when he was 12 to 18. His last foster parents loved him very much and he would always tlak about how he wanted to be a pilot, So when he turned 18 he joined an airfoce and was on his own. When he gt on his first plane ride he said "and this is where the adventure begins again." Opinion: My favorite character in this book was David becuase he always stayed strong. Even though sometimes he wasnt sure he was going to achieve his goal he wasnt going to give up. I thought this was probaby one of the ebst books I ever read and I really understood it, and im very glade i read this book. Recomend: I recomend this book to kids from 7 - adults. I recomend it 7, 8, 9,10, 11, and 12 graders so they know what it is like to get abbused and how horrible it is and how he had such a miserable life. I recomend it for adults so they would know what the children go threw when you abuse them and how horrible it is. So maybe they wont do it to there kids.